Development Education and Awareness Raising (DEAR) contribute to the eradication of poverty and to the promotion of sustainable development through public awareness raising and education approaches and activities that are based on values of human rights, social responsibility, gender equality, and a sense of belonging to one world; on ideas and understandings of the disparities in human living conditions and of efforts to overcome such disparities; and on participation in democratic actions that influence social, economic, political or environmental situations that affect poverty and sustainable development. The aim of Development Education and Awareness Raising (DEAR) is to enable every person in Europe to have life-long access to opportunities to be aware of and to understand global development concerns and the local and personal relevance of those concerns, and to enact their rights and responsibilities as inhabitants of an interdependent and changing world by affecting change for a just and sustainable world. "By education I mean an all-round drawing out of the best in the child and man-body, mind and spirit." Mahatma Gandhi. Our development education & awareness raising (DEAR) projects are ideal resources for both primary and post-primary teachers and schools participating in the World Wise Global Schools (WWGS) programme. They will help you and your students to engage in analysis, reflection and action for local and global citizenship and participation by enabling learners to recognise the interconnected nature of our lives and the lives of people in the global South. Just Forests works with the formal and non-formal education sectors in Ireland. We employ simple hands-on, Popular Education, to facilitate attitudinal change, which embraces the core elements of Development Education (DE) and Education for Sustainable Development (ESD) methods. We like to take a "whole school" approach to development education as we feel our work impacts many subject areas in post-primary education. 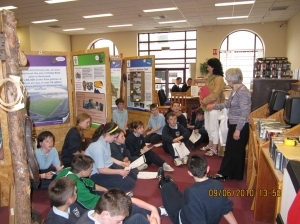 The overall rationale for the programme of activity outlined by Just Forests below is to stimulate, encourage and support schools in Ireland with issues of sustainable development through the lens of trees, forests and related issues. If we're going to reduce poverty and create 'sustainable' employment in the long term, we need to recognise how it's linked to the environment and our dependence on natural resources. Just Forests approach to 'sustainable development' is a vision of development that encompasses populations, animals and plant species, ecosystems, natural resources and that integrates concerns such as the fight against poverty...we have to learn our way out of current social and environmental problems and learn to live sustainably. We need to place a real economic value on the benefits to biodiversity, indigenous peoples and to minimise forest plunder, greenhouse gas emissions and strategic rainforest sinks, to reduce consequences of climate change. Author and Patron of Just Forests.